The following home energy efficient tips are designed to help you think proactively about how you utilize energy, and of course, how to cut your costs on utility expenses. Perhaps it is time to take a step back in the days before HVAC before we reach for the air conditioner this summer. What did the old folks do when the sun was beaming down all day long? Well for starters, they had louvered wooden shutters that kept the heat away in the daytime. While at night, they left the windows open behind them so the cooling night air could drift through the house. We decided to use this post to explore modern alternatives to these smart home energy saving moves. Glass is a great heat conductor. If we put our hand on the inside of a glass window on a hot summer day, we may find it surprisingly warm. The point is, that amount of heat is pouring through the glass all day. Trying to manage this ‘heat attack’ just with air-conditioning is like controlling crab grass by trimming the flowers because they just keep coming back. The best way to stop heat penetrating through windows is to stop it at the source with Low-E coated glass. Modern versions allow visible light through while minimizing heat gain inside the room. Low-E Glass on a Cover Glass window blocks ultraviolet light. This counters UV light's damaging effect, which leads deterioration, fading in materials and wall covering damage. What's better? These windows don't limit visit light, but instead, redistribute it effectively and ensure your interior always remains happy and bright. The coating of low-E glass is microscopic and transparent, which provides an added layer of protection against micro-abrasive items such as sand and dust. When tested against the elements your windows will never look more clearer. There is also the added benefit of maintenance and easy up-keep the low-E glass coating provides; annoying water particles that usually stick to the surface of the windows won't be visible. Having Cover Glass windows - which feature state-of-the-art low-E glass technology, assures you have more control over your energy spending. You simply depend less on artificial means to regulate climate control. Because the coated material filters infrared rays, which controls heat transmission, your home with automatically adjust to create a comfortable environment. Especially along California’s coast, we enjoy the blessings of cool night breezes. As the land cools down, the temperature of the sea stays relatively the same. As the warmer oceanic air rises, air from the land flows in to restore the balance. Sometimes this is so gentle we hardly know this is happening. However, the gentle air movement continues all night long. It follows that cooling air will flow through the house from the land towards the sea if we leave windows open on both sides. This is using the power of nature to our advantage without spending a dime. What’s more, we could sleep peacefully through the night, and wake refreshed after breathing fresh air while we slept. When day breaks, we can close the windows again knowing our Low-E glass will take over our natural temperature control. We may need to turn the air-conditioning on, but we will use far less energy to stabilize things. Our final home energy tip is to stop generating unnecessary heat ourselves. During hotter days, avoid using larger home appliances like microwaves, washing machines, dryers, and dishwashers. These larger home appliances tend to emit larger heat signatures. Using most natural lighting options allow you turn more lights off, saving you money on your energy bill. Skylights and glass walls are good examples of utilizing natural forms of light. Cooking and baking also fall into the category of large heat generating appliances. Luckily, hotter summer weather leads to outdoor dining, cooking, and barbecuing. 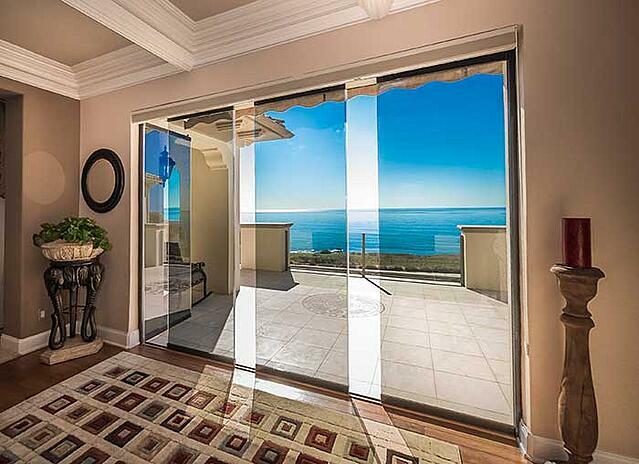 Welcome the Outside In™ during the warm summer evenings and slide open your frameless glass door panels.